Part 1 of 5: In this five-part series, we provide an introduction to the world of tensioned membrane structures, including the history, current applications, engineering concepts, modern materials, and the innovative benefits. Click here to read additional posts. Tensioned membrane structures (aka tensile fabric structures) are dynamic types of modern architecture that are celebrated for their incredible versatility. 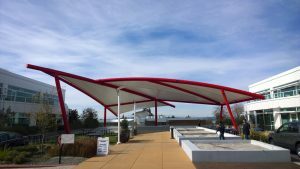 From addressing landscape architecture trends to overcoming more traditional challenges, tensioned membrane structures have an incredibly diverse range of applications. The concept behind tensioned membrane structures isn’t new. Humans have been using forms of tensioned fabric to create tent structures for centuries, but only in the past few decades have we begun to adapt those principles to create technologically advanced and permanent variations. Today’s tensioned membrane structures go far beyond tent designs to include artistic and iconic shade structures, 3D tensile facades, and fabric roof structures that span impressive distances. The types of applications for tensioned membrane structures are only limited by the architect or designer’s imagination. 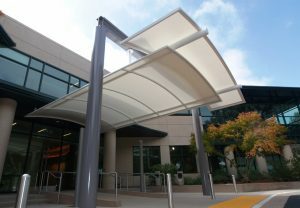 Advanced fabric options such as PTFE-coated fiberglass or PVC membrane, unique styles and shapes, and a variety of frame finishes make the possibilities seem endless. 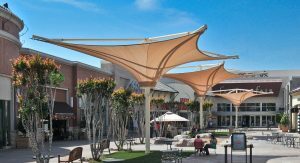 Entertainment & Retail – In the entertainment and retail spaces, tensioned membrane structures offer free-form canopy designs that blend beauty with performance. Projects may include creating amphitheaters, shading restaurant patios, or creating functional sculptures such as architectural umbrellas. The possibilities are endless. Commercial Properties – Commercial properties, such as office buildings and corporate campuses, are often drawn to tensioned membrane structures because of their modern design aesthetics, energy efficiency benefits, and ability to create more functional outdoor spaces. 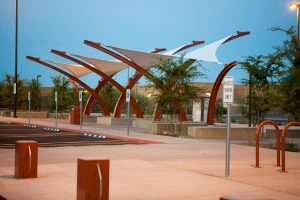 Projects may include unique entryways that add dimension to an otherwise simple building, tensile facades that reduce solar heat gain, or shade sails that stretch over outdoor seating areas. Institutional Properties – Institutional properties aren’t generally known for their aesthetic appeal or intuitive designs. However, tensioned membrane structures offer a cost-effective solution for adding to the aesthetics and functionality. Projects may include designing energy saving tensile facades for hospitals, iconic sculptures on your university campus, or functional entryways or waiting areas for government buildings. Sports Facilities & Parks – From community parks to athletic training centers to sports arenas, tensioned membrane structures provide weather protection for unique outdoor spaces. Projects may include free-standing structures over picnic areas, canopies over spectator seating, or long expanses of coverage without support beams for playing fields. Transportation Centers – Whether discussing airports or bus stops, every traveler and commuter can tell you the importance of weather protection at transportation centers. Tensioned membrane structures provide that much needed shade and weather barrier while also empowering architects and designers to create exciting signature designs. Projects may include covered and heated valet areas, iconic shade designs in transit centers, or unique weather protection options for parking garages. For a deeper look into how tensioned membrane structures can be applied to different types of projects, visit our blog. Are Tensioned Membrane Structures Right for Your Next Project?